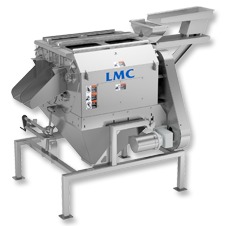 The second machine, the LMC Split Nut Blancher, is designed to blanch splits and to split and blanch whole peanut kernels. The LMC Split Nut Blancher is most popular split nut blancher used when making peanut butter. Built for reliability and performance, the LMC Split Nut Blancher also offers ease of access for proper sanitation.Both our Whole Nut and Split Nut Blanchers are fully customizable. Combination and configuration can be customized to a specific crop variety. Sizes and dimensions can be customized to meet your space requirements.